The building shows exhibitions about Israeli design, and on our visit was showing bathing suits and related designs. The structure is located on the edge of the traditional city centre, in a cultural quarter which is yet to complete. The building appears as an organic form, but within it is essentially formed by a large upper and a small lower gallery, both rectilinear. As a group we discussed the anomaly of billowing coloured swirls outside and the restrained white spaces within. The spaces might allow curatorial flexibility but the fact that their perimeter wasn’t reflected externally concerned us architect visitors as we have all been taught that form should be ‘honest’ and reflect the form of the space held within. In terms of route one enters between the two galleries under a ‘sagging’ dark-coloured underbelly into a small organic-shaped space, full of light and animated by the stripey shadows cast by the swirling structure above. It is this warm-coloured structure that makes the building. It is formed from Cor-ten steel, made in Italy, that has been exposed to sunlight in varying extents to create different hues. The horizontal striation goes from burgundy at the base to orange stripes at the top. The colours will keep changing slowly over the years allowing the building to gradually metamorphise in appearance. The circulation in the building enters a small lobby area and then one can either visit the upper gallery via a Guggenheim-esque external ramp or visit the lower gallery first and access the upper next via a series of stairs that are internal. I found the circulation slightly ambivalent, but providing some energy to the building. One could imagine the route being pushed further though – you see the swirls above and naturally feel like you should be able to follow a similar route! 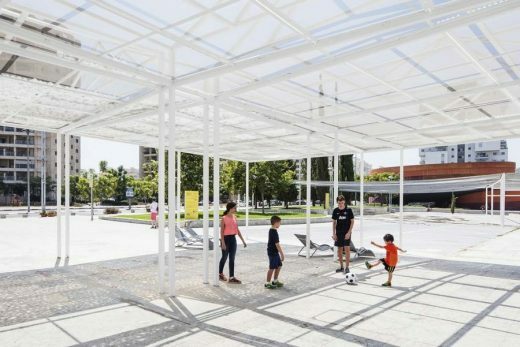 A plaza pavilion for Israel’s national design museum, Design Museum Holon, shows that design can do more than fulfill a public need: it can foster engaging public experiences.